Every once in a while, a cover speaks to me and I just know I have to read the book it belongs to. Such was the case with Margaret McMullan's Aftermath Lounge. The combination of title and atmosphere created by the cover image (the solitude, those bent and broken trees) drew me in like a magnet and I was powerless to resist. And no, the dog didn't hurt, but it was something about that dog that evoked a sense of longing and desolation I needed to know about. Turns out the cover serves the content well. Aftermath Lounge is a set of ten beautifully interwoven short stories about the people of the Mississippi Gulf Coast, taking place (for the most part) in the five years following Hurricane Katrina. Hence, the aftermath. What I loved about these stories is their focus not on the storm or the physical atrocities it left in its wake, though obviously those are necessary elemental backdrops, but on the despair and resiliency of those who experienced it, either directly or through the inevitable ripples it caused in their world. Each entry is a shot to the chest in its own way, but I was never more impressed by McMullan's short story skills as I was when reading the shortest of them. Writing a good short story is no easy feat. Writing one consisting of a few paragraphs that not only fills the frame but paints a heartbreaking picture is an awe-inspiring talent. Take Holiday World, the third story in the set and the first to take place post-Katrina. Displaced with his family to Indiana, Billy finds himself separated from them at a water park. A water park. After surviving a hurricane and floods. The final lines took the air out of me. My notes for this story consist simply of the following: "Wow." As with Holiday World, not all of the stories take place in Mississippi, with many following survivors or the family of survivors through their post-hurricane displacements. Despite the different settings, the Mississippi Gulf and Katrina are still an umbrella the characters can't get out from underneath, as the place and the storm have become part of them. No matter where they land, the echoes of the storm influence their lives and loves. They cannot shake the "Katrina patina." His mother gave Teddy's grandfather the gun and his grandmother the keys. She needed neither, she said, because everything was gone. "Just gone," she said again and again, her eyes welling up. "Nothing to open and no one to shoot." The hurricane had gone and washed through his grandparents' home and now it felt as though it was washing through their lives again. This storm had grabbed hold of them and wouldn't let go. Many of the characters find their way into multiple stories, such that the group together tells the tale of many of them over the five year period. In Aftermath Lounge, recurring character Catch is taking care of the Zimmer property while it's being rebuilt. He wanders the site picking up pieces of broken china, and each night he sees how the pieces might fit together, working through multiple tubes of crazy glue putting plates, cups, bowls and saucers back together again, despite the chips and cracks he can never fill. Catch reached under the bed and pulled out a shoebox. He emptied his pockets into the box, which was full of paper scraps. He thought of the words 'critical' and 'mass' and all the words on scraps of pages he'd found, the sentences he'd saved, some of which stood out like warning signs or prophesies...Maybe someday it would all make sense. 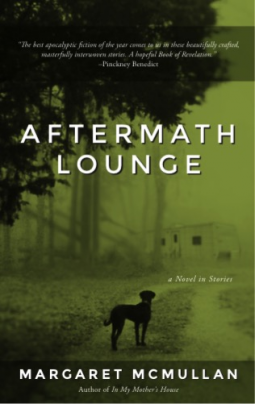 Each of the stories in Aftermath Lounge was previously published elsewhere, and while they certainly stand on their own, they make for a powerful collection. There is no respite, not even in the two pre-Katrina stories that start the book, because we know what's coming. We know what these characters are in for, what lies ahead. What we can't know is how they will react and rebound, and the pain and beauty in those stories are what make the book whole. Margaret McMullan will be on tour discussing Aftermath Lounge beginning this week, and you can see a schedule of events on her website. I imagine these will be fascinating discussions, particularly leading up to the tenth anniversary of Katrina on August 29. The book will be available in some stores, but you can always get a copy through the publisher, Calypso Editions. STREET SENSE: As someone who often has a hard time "getting" short stories, I can't recommend this book highly enough. Even though they stand alone, the intertwining of the characters and story threads that run through more than one piece make this, as it is billed, a novel in stories, beautifully done. Maybe next time, because there would always be a next time, next time when the waters rose up again in walls, forcing itself into the homes and lives of all those people, maybe next time it will not carry so much away. Volunteer trumpet vines bloomed and all the trees that had survived the hurricane were tilted away from the water like women fleeing. COVER NERD SAYS: Since I started this review talking about the cover, where I stand on it is likely already fairly clear. I loved it. It got me to read a book I knew nothing about, and when I was done I could look back at the cover and know it hadn't steered me wrong. This sounds great. Adding it to my list. Hope you like it. I generally have a hard time with shorts (my own failing), but really connected with these. Did you think about exchanging with the ultimate Bitcoin exchange company: YoBit.